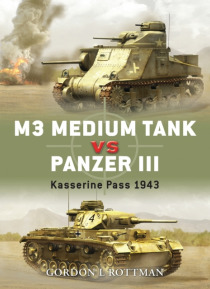 This was a duel between the stalwart of the Wehrmacht armored divisions the Panzerkampfwagen III and the American's as yet untested M3 Grant. In reality both would prove unequal to the task as they floundered amidst the rugged hills and ravines of the Tunisian landscape. This book charts the design and development of these two disparate rivals their vastly different armament and armor as well as t… heir tactical concepts. Analysing the strengths and weaknesses of these two opponents, this book explores the successes and failures of the Grant and Panzer III as they clashed at the critical battles of North Africa. Moreover it is an insight into the lives of the tank crews themselves as they struggled with the twin horrors of tank warfare and the fight for survival amidst some of the most inhospitable terrain on earth.